Madame Alfred Carrière was planted in my garden in the spring of 1993 - one of the first and most steadfast of all my roses. She was purchased from Roses of Yesterday and Today in Corralitos while Pat Wiley was running the business. Many of the others on that first large purchase have long since departed, either by death or extraction. 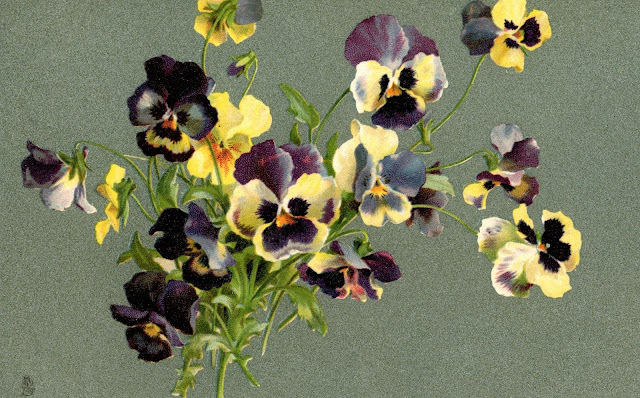 Madame Alfred was named for the wife of the chief editor of Revue horticole - a 19th century French horticultural magazine. She loves her location on a south facing corner of my house and has continued to bloom steadily all season long - in spite of the mosaic virus it contracted from infected rootstock. New canes arrive every year. Past recent pruning attempts were committed in a frenzy after large pieces of it were torn from its moorings and flung it into the yard by wicked winter winds. She hadn't been methodically guided and supported properly in years. This season, however, she got the attention she needed and the results are stunning. She will continue to grow and bloom also season. At the base of this climber is a shallow ditch which actually carries rain water from the back yard out under the fence to the front yard and eventually down a storm drain. The rose's roots reach out under the soil in all directions. It was given two fists full of alfalfa pellets in February and fertilizer in March and early April. Here's the result on April 28, 2018. All roses benefit from some pruning. If you hadn't done any this year, you still can cut down on disease and encourage blooms by thinning out your bush and allowing the best canes to develop. Danger. Danger. Danger. Downy Mildew is a disease of many plants particularly vining ones like grapes, cucumbers, melons, and squash but it also will affect ornamental plants including roses. The weather in Salinas has been particularly unusual in 2018. The rains did not start in earnest until March. By then, most gardens had been pruned weeks before and leaves were already out. When the rains began, temperatures dropped and the leaves were often wet for long periods of time. With ever increasing sunshine and continued low temperatures, the ideal conditions for downy mildew were in place. One of my new roses, a hybrid tea named Sacred Heart, came from a local nursery. It was in the reduced-for-quick-//sale section of the parking lot and had been at the nursery in all likelihood for at least 12 months. That's usually a plus as such roses are eager to have a new pot and fresh soil and respond well when they get them. Like all other new plants in my garden Sacred Heart was potted up, pruned a bit with all old leaves removed. I hadn't sprayed the pruned canes with a chlorine solution or hydrogen peroxide but trusted things would be fine. Apparently, it brought many spores of downy mildew with it. Just last week, I noticed mysterious blotches on its new leaves. 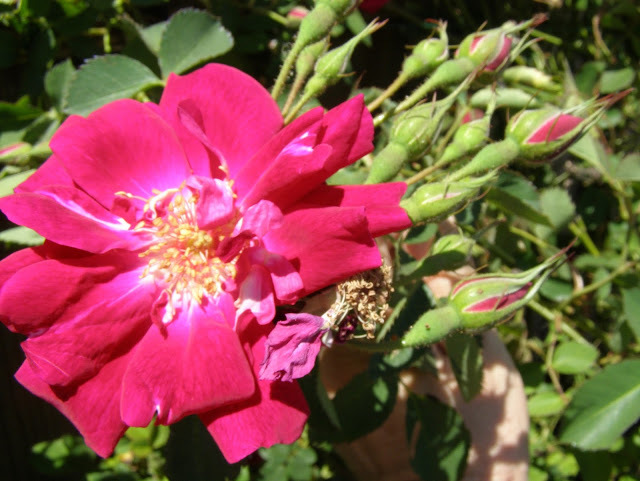 I've had plenty of experience with the three common fungal diseases in roses: black spot, rust, and powdery mildew. But these blotches were different. My first diagnosis was sunburn. It can happen to leaves and canes which have been growing in the shade (very cloudy weather even) and suddenly the April sunshine beams down. Reason prevailed. Why did Sacred Heart get sunburned when the other new roses around it did not? I reached out to fellow rosarians for help and the answer came in: downy mildew. All agreed the weather this season has been unusual. Winter came late and wet and often days went by when the rose leaves never completely dried off and the temperatures were often highs around 60 degrees and lows in the 40s. Other reported effects on roses were short stems on the hybrid teas, many blind shoots (new canes with no buds at the top), and "high rose tide" delays by at least two weeks. Unlike the true fungal diseases mentioned above, downy mildew is caused by an organism more closely related to algae. Therefore, fungal sprays won't have any affect on curtailing it. The disease isn't all that common along the Central Coast because we usually dry out by the time leaves are in profusion. Its spores are airborne and usually associated with poor sanitation and lots of water. It's an algae so think wet: wet infected leaves, stems and soil. Also different from the fungal diseases, downy mildew is a pathogen. If left untreated, it will kill the plant. It is parasitic. "One of the "defining" characteristics of Downy is that it does not cross the leaf veins. So - in your photo you can see the blotches of the mildew stop at a vein and start on the other side. People do get it confused with BS because it is often on the same leaf at the same time. And its blotches can be oval or circular - but they still do not go into a vein. Baldo (Villegas, an environmental research scientist for California’s Food and Agriculture Department and a noted expert of plant pests and diseases) taught us - long, long ago - to turn the leaf over, pinch it closed so the mid-vein stands up and then look closely at the blotch close to it with a 10x or better lens. You'll just barely be able to see tiny fuzzy growth rising from the leaf surface. My eyes are so bad now I don't bother anymore. I just de-leaf." The best control involves isolating the plant immediately if it's in a pot. If that's not possible, pull off all infected leaves and spray what's left with a mild solution of a tablespoon of bleach to a quart of water. If you halt its progress (and the weather warms up again), you will most likely get it under control. As a further safeguard, remember to remove all leaf matter at next season's garden clean up. Safest way to control downy mildew. Water well and leaves will reappear. Ever since I began gardening in Salinas in 1993, I've come across a tiny, worm-like salamander sharing the yard with me. My first encounters, sadly, had to do with mistakenly cutting the poor creature in half with my trowel. Its tail twitched and writhed in rapid convulsions and startled me awake from my routine digging and weeding. It captured my entire attention. I've since learned that that display was one of the slender salamander's primary defense mechanisms. While I watched its very long tail flop about on the soil, its body scurried away to hide and find a safe place to grow another one. Working in my front yard recently, I lifted a brick and discovered a slender salamander. It laid perfectly still, its color not dissimilar to Salinas adobe soil. That was another defense mechanism. Two days before, I'd assembled a terrarium in a fishbowl with dark green ground moss, dried bark-covered rose canes replete with bright green moss, and attractive rocks. I captured the salamander, carried him over to the terrarium and placed him inside. He (or she) immediately disappeared beneath a few rocks and into the moist soil. This encounter set me on a path of discovery. I needed to know more about California slender salamanders. In 2001, scientists (Jockusch, Yanev and Wake) did an extensive survey of these long, thin amphibians identifying differences great enough for them to determine several unique species inhabiting California. They include the Gabilan Mountains Slender Salamander (Batrachoseps gavilanensis), the Santa Lucia Slender Salamander (Batrachoseps luciae), and the most widespread - California Slender Salamander (Batrachoseps attenuatus). Gabilan Mountains Slender Salamanders range begins in southern Santa Cruz County includes the Salinas Valley and San Benito County down to northern San Luis Obispo including the eastern side of the Santa Lucia Mountains. The Santa Lucia Mountains Slender Salamander's range includes the western side of the Santa Lucia Mountains out to the Pacific Ocean and down the coast to San Luis Obispo County. There are places where the two species share ranges. The California Slender Salamander inhabits most of northern California from Santa Cruz County north. they estivate which is similar to hibernate, but occurs during dry periods. However, if the ground is kept moist such as in Salinas gardens. They stay awake the entire year. they can live for 12 years. Slender salamanders are not considered endangered but their habitat is challenged by use of pesticides on lawns and in gardens, by the shrinking size of home gardens, and by the increased amount of paved surfaces. You can establish them in your garden by providing a few flat boards, bricks and smooth rocks lying on the soil throughout your garden. In fact, every true garden should have a dark, moist corner with a few rotting logs on the surface to encourage some diversity of life.
. . . and they both go bob-bob-bobbing along. 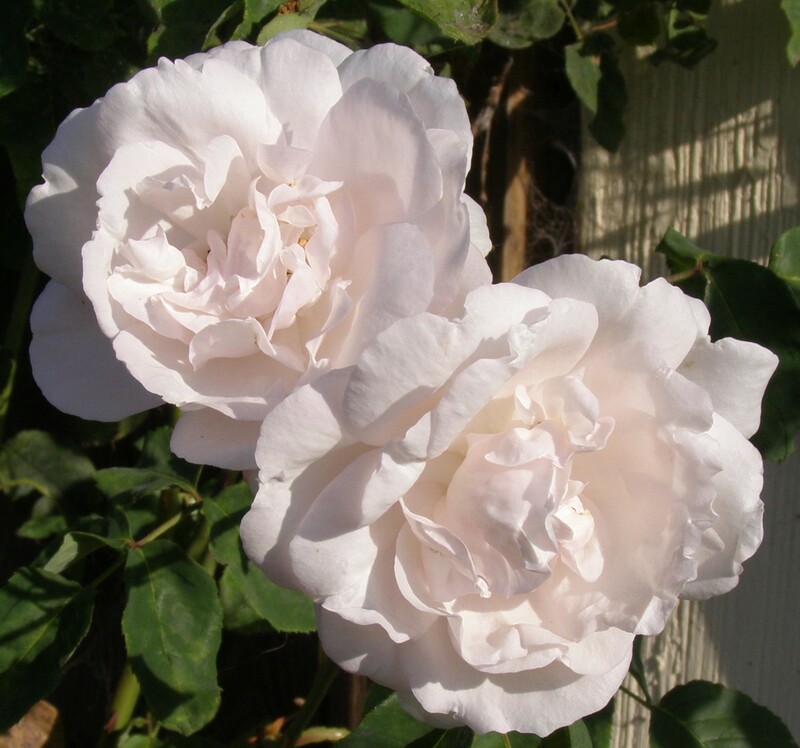 The American Rose Society gives it the name Gloire des Rosamanes which can be loosely translated from the French as "The Pride of Rose Maniacs." 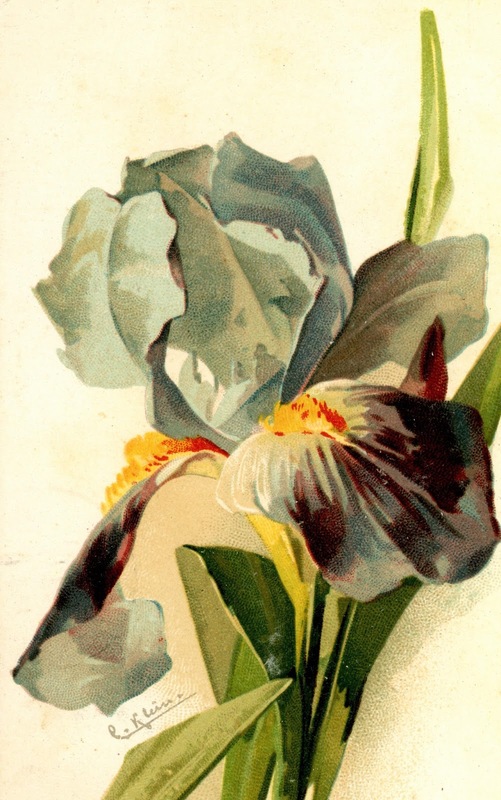 It has been around since 1825 where it was bred by Monsieur Plantier in Lyons using a remontant rose from China and a damask rose, although there may be some doubt to the pollen part. Ragged Robin (or Red Robin) became very popular as it blooms in large flushes through out the season. What it lacks in form, it makes up for in vitality, color, and generosity of flowers. 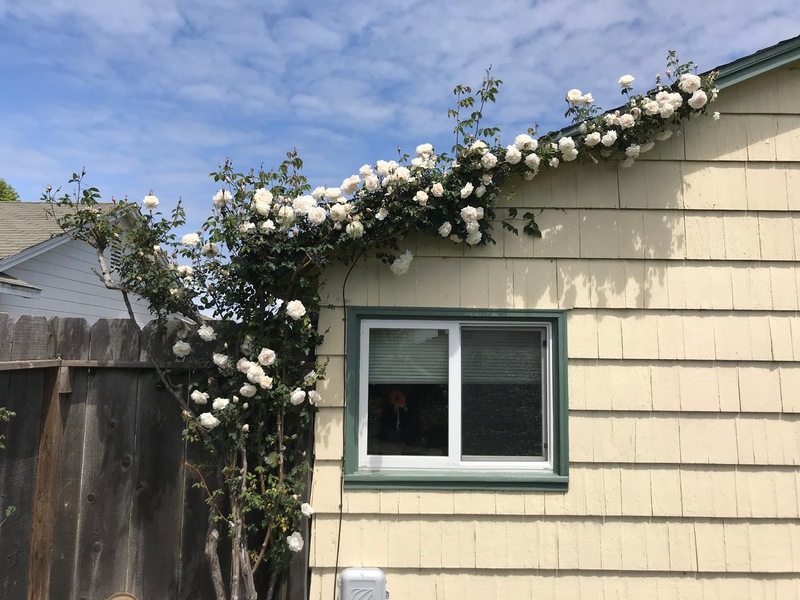 It's a perfect rose for a fence and will easily go to 8 feet by 8 feet. An annual winter pruning will keep it in check and allow you to thin it out. I've even pruned mine back midseason and responded with a springtime-like flowering. Gloire des Rosomanes is one of the first roses to bloom in the spring. Because of its China ancestry, it's one of the first roses to bloom in the spring with a massive display of crimson red petals resting on top of light green, somewhat pointed leaves. 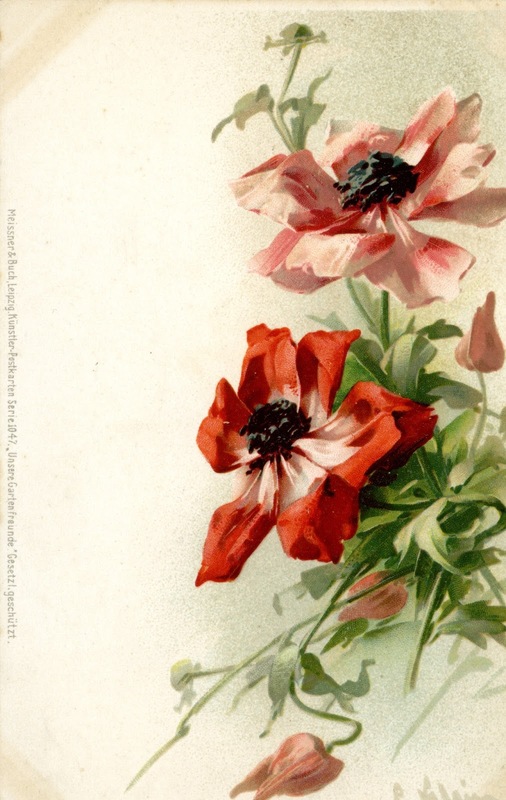 The flower stems are short and individual blooms last only two or three days. It cleans itself perfectly. Regular deadheading will keep in flowering all season long. 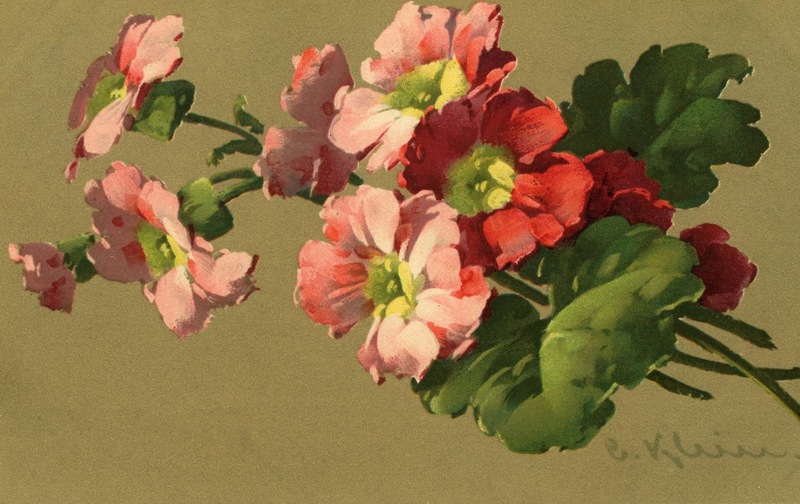 You may find Ragged Robin blooming in many old neighborhoods in California as it once was used as a rootstock. My plant was rose rustled out of a yard on Van Buren Street in Monterey. It was easy to root and has been in my garden for well over 20 years. Unlike many old garden roses, it does not send out runners and stays right where it was planted. 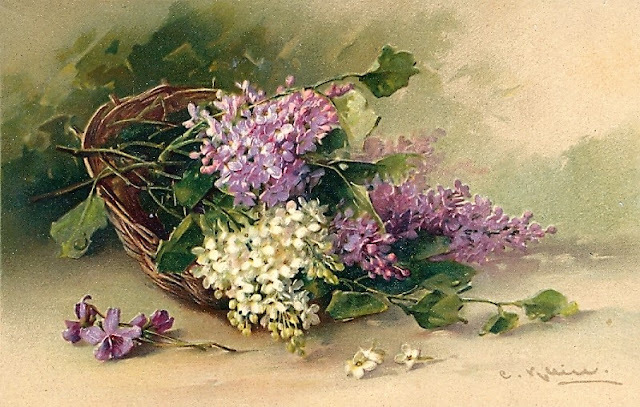 Here's a 9-minute video showing the creativity and talent of German painter Catharina Klein (1861-1929) in portraying iris, primrose, lilacs, flowering trees and more. Click here. A few more pictures in this collection. To see the video with dozens of paintings, Click here. Learn about fertilizers, chemical and organic, from experienced gardeners in a well-established garden. The Monterey Bay Rose Society is holding its monthly meeting at 10 a.m., Saturday, April 14 in the Display Garden at the Santa Cruz County Fairgrounds. The meeting is open to the public and will conclude with a potluck luncheon. Here's a great way to discover roses you may fall in love with AND grow well here with few problems AND often smell delicious. 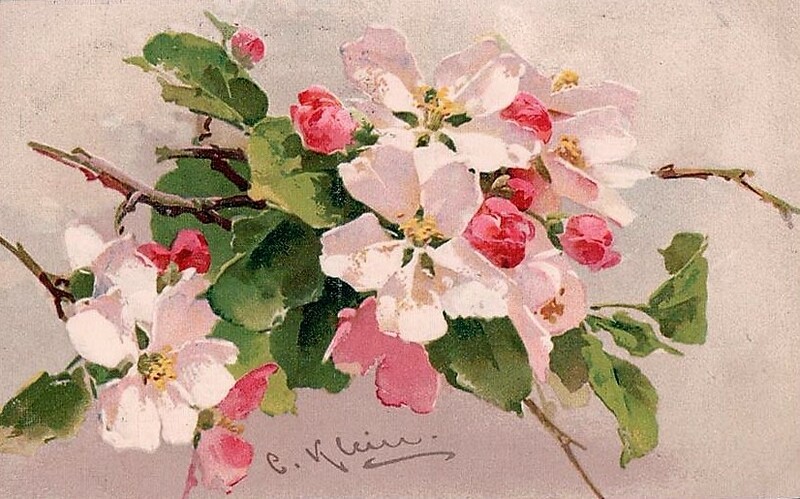 With the late winter we've had, we can't promise a garden full of blossoms but there will definitely be some to admire and enjoy. Consulting rosarians will be on hand to help you with your rose questions. Bring in your unnamed flowers and we might be able to tell you what they are. For the potluck, please bring your favorite dish to share and RSVP to Janey Leonardich at 831-722-7958 or sweeete940@gmail.com by Wednesday, April 11, so we know how many to prepare for. Santa Cruz County Fairgrounds MBRS Display Rose Garden 2601 E. Lake Ave. Watsonville.Take the Livestock/Horseshow entrance (2nd entrance not the Main entrance), across the road from Sierra Azul Nursery. TOPIC: How Do Our Roses Grow? We will take you through the rose beds and see how the roses are growing this season. 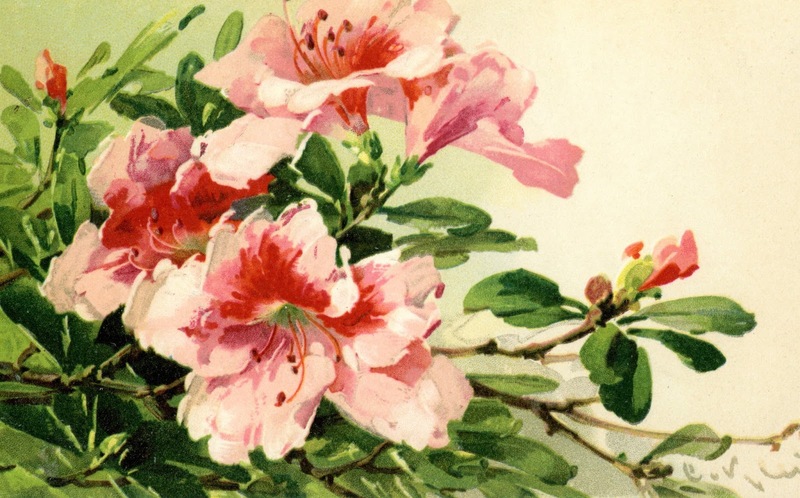 We will discuss fertilizers, weeding, finger pruning, and more. The days are now longer than the nights and the low temperatures continue to climb. Those factors combined with the wet March weather and everyone should see a real boost in plant growth. I tackled two very large patio plants. They had been growing in their pots for more than a dozen years. This was slow going as they were both extremely pot bound and way past ready for new containers. One, the windmill palm (Trachycarpus fortunei), I bought for a few dollars from the TLC section at Sierra Azul Nursery in Watsonville, certainly 15 years ago. During its first two years on my patio, it brought back its true form and vigor. It's a very clean, container-loving palm and its foliage offers a great contrast to most other plants. It's also one of the hardiest palms and I never have to worry about Salinas' mild freezes. It was, however, constantly drying out and needing water. That's a sure-fire sign its time for a larger container. As the photo demonstrates, it had actually consumed most of the original soil and had little else to sustain it. Extracting it wasn't easy. It had been growing in that large terracotta pot so I couldn't just cut it out and I wanted to reuse the pot. So with some rolling, tugging, and shaking - it finally released itself. It was a solid mass of roots. The new container was a half wine barrel purchased from The Home Depot which also sported a nice bit of dark wood stain. The barrel was considerably wider but not significantly taller. Bonsai gardeners have always had to trim roots as well as branches. I got my pruning saw out and simply cut off the bottom 7 inches of the root mass. It was now a perfect fit. All of this took some doing as I estimate the windmill palm weighed about 60 pounds. I made up my own soil to save some money. I combined cheap topsoil with cow manure and mixed in lots of Perlite to provide good drainage. The topsoil had a significant amount of humus in it which will provide microbes and retain some moisture. My second wine barrel was to be the home of my ponytail palm (Beaucarnea recurvata) which had been in its 15 gallon plastic pot for more than 10 years. I hadn't realized that the plant's roots had split the hidden side of the pot from top to bottom! Ponytail Palm in its new wine barrel home. I bought it from the little nursery that used to be on Blanco Road, Salinas right at the Salinas River Bridge. It was only in a 4-inch pot when I got it. I had grown it as a houseplant in Arlington, Virginia and remembered it as being attractive and needing little attention. Its roots are much more flexible than the true palm so I was able to fit it into its new home without much effort. In both cases, I held off watering for a few days. Newly repotted succulents need a chance to seal off any broken or cracked roots. This will prevent rot. 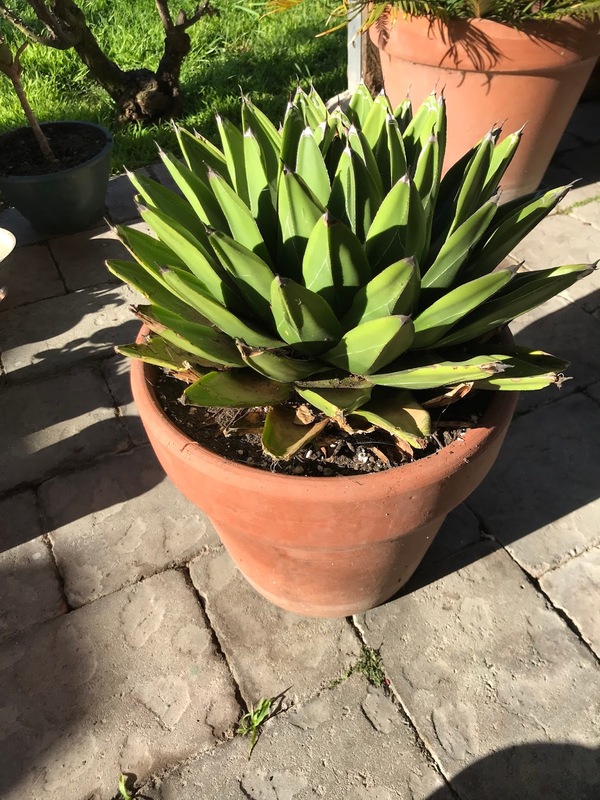 Agave victoriae-reginae in its new pot. The freeing up of one large terracotta pot meant a shuffling up of several other plants into larger containers. The Agave attenuata went into the windmill's pot. The Agave victoriae-reginae went into the attenuata's pot. The golden barrel cactus (Echinocactus grusonii) got the victoriae-reginae's house. Healthy plants need healthy soil. When they grown in containers, it's a good idea to replace the soil and trim the roots as well as the branches. Golden barrel cactus in its new home.